Does dreaming about yarn mean you knit too much? Most likely, but anyways a few months ago I had a dream that someone gave me a skein of a beautiful cobweb weight dark greenish blue yarn. Strangely it wasn’t a yarn that I’d have considered buying myself, but I woke up sleepily thinking of what I was going to do with my gorgeous gift yarn. Until, of course, I woke up properly and realised that I didn’t have the yarn at all. Damn. Later that day I was reading Dee’s blog*, and she’d just posted about putting up the week’s yarn preview. Before I clicked over to investigate that week’s offerings I left a comment saying that I’d had a dream about yarn and that I was going to see if my dream yarn had somehow appeared in their workshop. It wasn’t there, but Dee took pity on me and humoured my oddness by offering to make me the yarn I had dreamt about. A few days and questions about colour later the yarn I’m now using for the Print o’ the Wave stole appeared on my doorstep (of course the yarn in the dream was a gift, but you can’t have everything!). Actually it was the doormat of my parents’ house and as soon as my mum saw the yarn she started telling me excitedly about how it reminded her of the sea in a particular place. So I had the yarn I had dreamed of, but it was destined to become something for my mum. 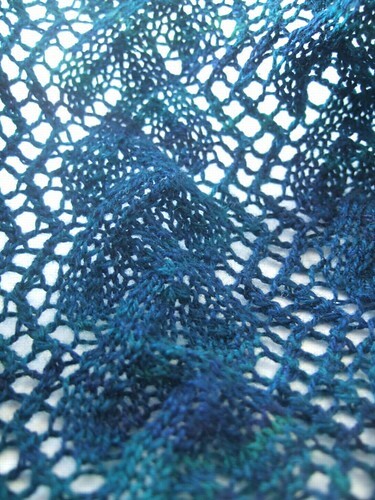 We agreed on a lace scarf / stole thing and I started swatching stitch patterns that reminded me of the sea. I kept coming back to one that seemed strangely familiar, of course it was the same as the one Eunny used for her stole. 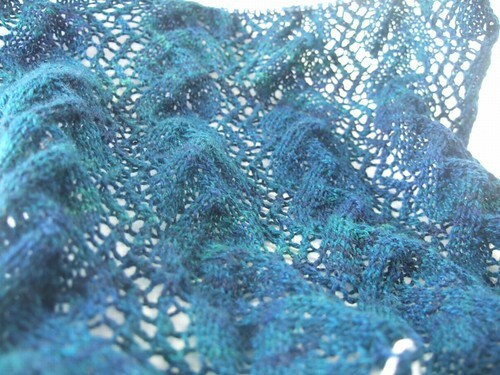 That was a few months ago, and determined to design my own sea stole and swamped by other projects, I put it aside. But now my mum’s birthday is in a few weeks, I’m still swamped by other design projects and I needed something portable to knit on. So I told myself that there is nothing wrong with knitting something from a pattern and no point in re-inventing the wheel and cast on. I’ve just been knitting this in little bits at times when I’ve not been at home or had the desire to tote around almost an entire jumper but it’s a delightful project and progressing nice and visibly. You know what I mean by that don’t you? When knitting even just a couple of rows on something makes it visibly larger. Love that. 8 repeats down and I don’t plan on doing the whole knit from both ends and graft in the centre thing so I do hope this horribly long rectangle continues to grow as if by magic. Whether my mum will be getting a finished stole for her birthday or one still on the needles to be completed by xmas though remains to be seen. 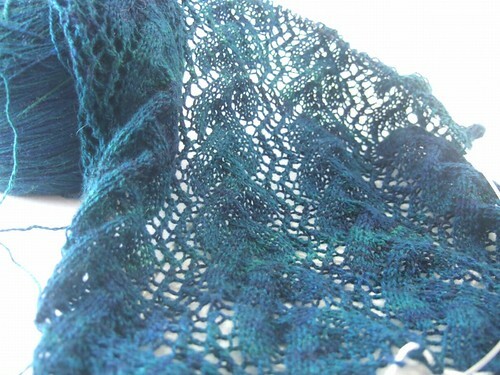 I’ve got the lace pattern memorised, in the sense that I know what comes next if I think about it, but not in the nice knit with an automatic rhythm sense – yet. I do hope that comes. *If you live under a rock and are thus unaware of the magic that Dee’s husband works with yarn and dye the Posh Yarn updates are every Sunday evening at 6pm GMT (I think!). I advise being busy at that time for the sake of your bank account. It’s dangerous stuff.